What we learned about Stonehenge this week is that it wasn’t built for summer celebrations. First reports of the discovery of a mass of huge stones buried near Stonehenge, appearing to be the remains of another ceremonial structure four times larger, included the tantalising suggestion that it was aligned to the position of the sun on the shortest day of the year. This echoes a remarkable discovery published 20 years ago by the late Professor John North, an expert on the history of human cosmology. In his book Stonehenge: Neolithic Man and the Cosmos, North showed by meticulous calculation how the alignment of Stonehenge was not, as was long supposed, to the Midsummer sunrise, but to its setting on the day of the Winter Solstice: in other words, to that very moment when the old year dies before nature begins its return to new life. For our Neolithic ancestors, it was thus a midwinter festival equivalent to our Christmas or the Roman Saturnalia. We must now await further word from the academic discoverers of this new “Super-henge” on how they think its builders 4,500 years ago, like those of Stonehenge, directed it towards the position of the sun at just the moment when the year dies to be reborn. It was this which, when I first wrote about it on December 24 2006, inspired one of my sub-editors to the memorable headline “Have yourself a Megalithic Christmas”. Please view our Stonehenge Winter Solstice and Christmas Tours. Archaeologists have discovered the remains of a massive stone monument buried under the bank of a stone-age enclosure known as Durrington Walls, just two miles from Stonehenge. Using powerful ground-penetrating radar, investigators from Birmingham and Bradford universities, alongside an international team of experts, have uncovered a 330m-long line of more than 50 massive stones, buried under part of the bank of Britain’s largest pre-historic henge. 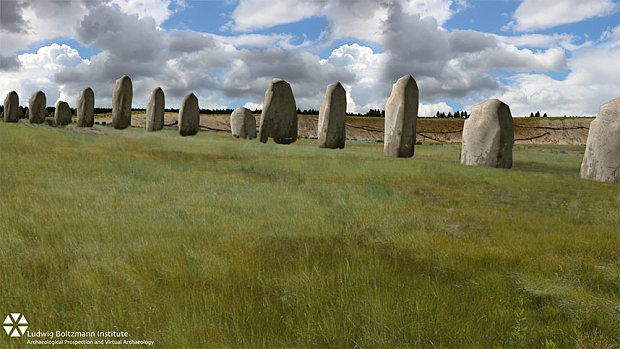 Professor Vincent Gaffney, an archaeologist on the project, said that the discovery has significant implications for our understanding of Stonehenge and its landscape setting. “Not only does this new evidence demonstrate a completely unexpected phase of monumental architecture at one of the greatest ceremonial sites in prehistoric Europe, the new stone row could well be contemporary with the famous Stonehenge sarsen circle or even earlier,” he said. Gaffney said that the stones are thought to have been erected more than 4,500 years ago to form a dramatic ritual arena. The monuments were grand, built to give the impression of authority to the living and the dead. However, as the megaliths are buried underground, visitors to the area will not be able to see them for themselves. Yet you can still get a great sense of their majesty if you use a bit of imagination, and Durrington Walls, the village where Stonehenge’s builders lived, is itself an interesting site. The henge at Durrington Walls has long mystified archaeologists because one side is straight while the rest of it is curved. It surrounds several smaller enclosures and timber circles, and is connected to a newly excavated later Neolithic settlement. Thousands of people travelled great distances to gather here and feast on roast pork and apples in midwinter. The area outside the ditch and bank was once a settlement, possibly housing hundreds of homes, making Durrington Walls the biggest village in north-west Europe at the time. The National Trust is hosting a Discover Durrington Walls event on October 10. On this 3-mile walk, you’ll explore the secrets of Durrington Walls – once home to the builders of Stonehenge – and discover 6,000 years of hidden history with National Trust’s landscape guides. Download a National Trust map for one of the following routes and explore for yourself. – Picnic area (not NT) at Stonehenge car park, 0.75 miles from this walking route.